Disembarking the airplane at Taoyuan airport, I felt a mix of apprehension, excitement and deeply rooted exhaustion. Lethargic from a twelve-hour journey spent in United Airline’s economy class, it had just hit me that this would be my first time returning to my parents’ birthplace since I had been a year old. 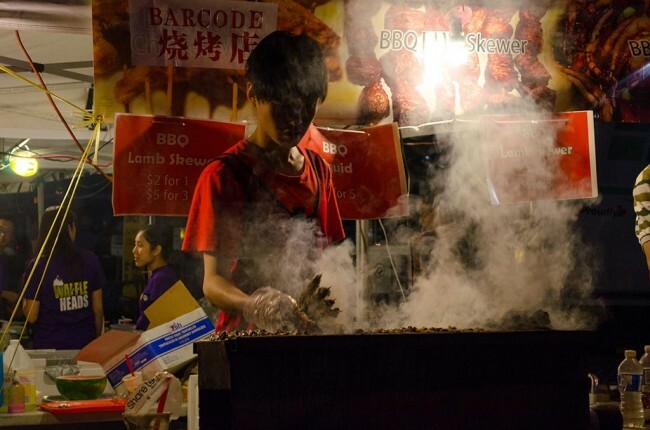 One of the vendors I photographed at the annual night market, Night It Up! in Markham, Ontario, Canada. As I waited for the elevator in the Vera List Center building earlier this week, I noticed a poster for Hyphenated Identities: Discourses, Questions, and Polemics, a conference presented jointly by The New School and Columbia University. Hyphenated identities have become an everyday fact woven into Canada’s social fabric; a norm established as part of Canada’s overarching narrative. Having been born to Taiwanese parents and lived in Canada for the majority of my life, the conference immediately piqued my curiosity regarding language, identity and citizenship. Photo of the Garden of Renova installation at Scotiabank Nuit Blanche in Toronto, 2014. A designer can assist in crafting a common narrative for all participants in the design process to see, ensuring that everyone is one the same page. As we mediate these experiences however, one question that arises in this process is: whose story does this tell, and why? How can design allow room for dialogue within the narratives that are being shared?